Last weekend I hosted my second party for our Monthly Supper Club. If you think I am an over-zealous hostess who wouldn’t let my friends have their turn hosting, well, I certainly am not. A few days after Pi(e) Day, we were reminiscing over YC’s candied bacon. Of course that led to a search for other interesting bacon recipes which landed me at King Arthur Flour’s Maple Bacon Biscuit Bake. I fell in love fast and furious. 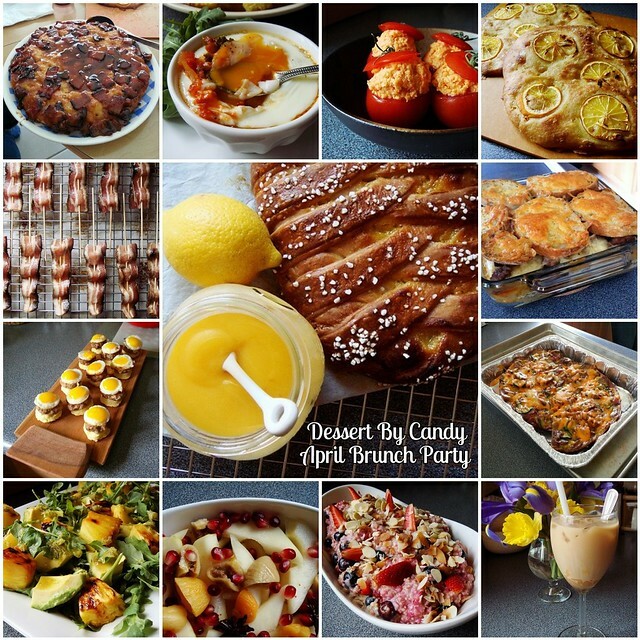 I needed an excuse to bake that recipe and there was no better occasion than throwing a brunch party. Race season and outdoor practices have begun and my free time is quickly diminishing before my eyes. I wasted no time in setting a date but hosting a large group requires a bit of planning. Fortunately, hosting brunch can be easy with plenty of made-ahead options. I scoured my list of to-cook dishes and came up with this ambitious yet unfussy menu. I love brunch, both eating and preparing. This is the meal which anything goes, sweet and savoury sitting happily side by side without controversy. 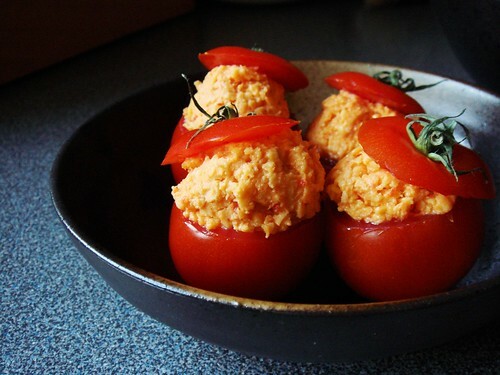 The meal began with Pimento Cheese Stuffed Tomatoes. Funnily enough, that was an impromptu dish I added just as the first guests arrived. I bought a box of beautiful Campari tomatoes on sale. I happily delegated my friends to hollow out the tomatoes and fill with homemade pimento cheese while I worked on finishing other dishes in the kitchen. The other appetizer was Maple Candied Bacon with Dark Chocolate. This dish made its way to the menu because I could not bear to have half a pound of leftover thick-cut bacon hanging around in the fridge. Bacon is not a staple at my home and I bought a package for the very specific purpose of making Maple Bacon Biscuit Bake. 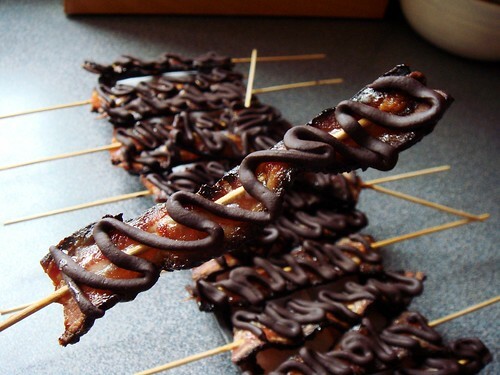 It was the most logical choice to turn the remaining bacon into these meat candies on a stick. In addition to the dishes I prepared, some of my guests contributed to the menu as well. JW treated us her famous homemade breakfast sausages. The minute she stepped into the kitchen, her deceptively small bag revealed a frying pan, spatula, sausage patties, homemade buttermilk biscuits, and a box of quail eggs. 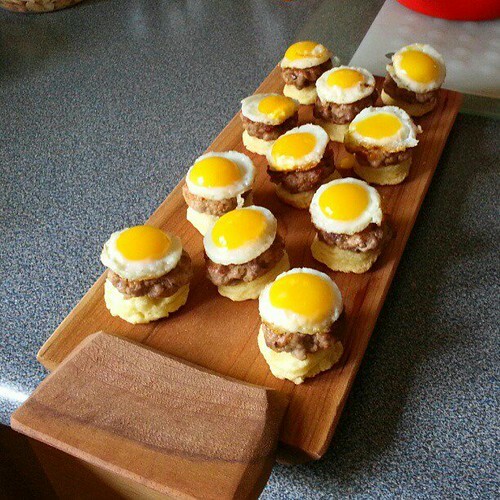 In the time I assembled the salad, she and sous chef JC fried the sausages, fried the quail eggs, trimmed, and plated these beautiful bite-size breakfast biscuits for all of us to enjoy. Egg play starring role in my brunch menu. I decided on a vegetarian course and a meat course. 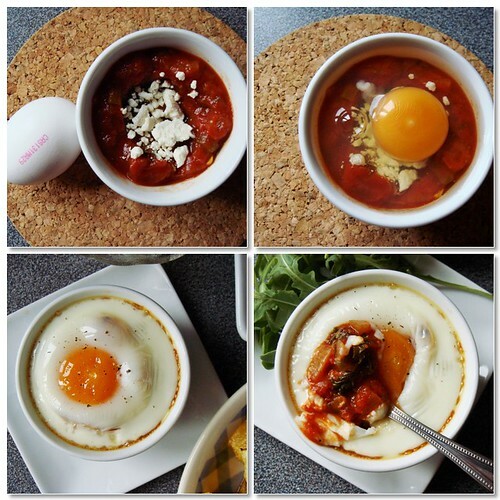 Shakshuka (eggs in spicy tomato sauce) is becoming more popular in the blogosphere lately with high praises sung from bloggers with great taste. I jumped at the opportunity to try it myself following David Lebovitz’s recipe. For ease of serving to a crowd, I opted to make the tomato sauce ahead of time and oven baked a tray of individual servings. As much as I love the simplicity of baked eggs, I missed the delicately wobbly poached egg. The tomato sauce itself was punchy with spices and the kale pieces were lovely. Don’t skimp on the hidden treasure of crumbled feta! The meat course of Sausage Portobello Breakfast Bake was a hostess dream. I adapted the simplified strata recipe at Simply Recipes for a completely veggie-free interpretation. Night before the party, chunks of portobello mushrooms were sautéed in bacon dripping and tossed with browned sweet Italian sausages. This meaty filling was layered with shredded Monterey Jack cheese between slices of ciabatta bread and soaked in custard overnight. Oven scheduling is tricky business but thankfully this casserole is very forgiving. The completely assembled casserole shared oven space with other dishes in a moderately hot oven until custard was set and cheese was bubbly. Meat, cheese, egg, and bread. Can’t go wrong with that. I have a love/hate relationship with frittata. Love to eat it, hate to make it. When I go out to brunch, there are always other more enticing options to lure my attention away. It’s been a few years since I last had a bite. 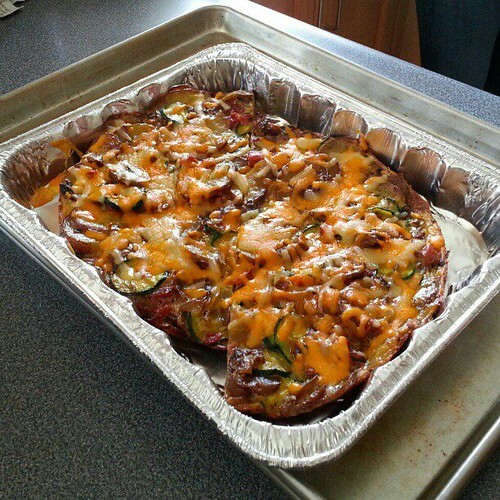 Imagine my excitement when CL showed up with a frittata packed with zucchini, potato, and lots of cheese! I happily devoured a big wedge. Salad is a mainstay of my diet and I am more than happy to share what I love with my friends. 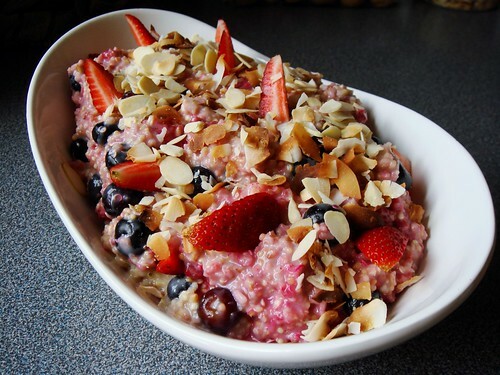 The first was a multi-grain breakfast salad of steel cut oats, quinoa, and millet dressed in maple yogurt lemon dressing with mixed berries, toasted almond, and coconut. If you care about nutrition, I can assure you to reap the goodness of whole grain, fibre, protein, and vitamins from all that I packed into one little bowl. But more importantly, wasn’t it gorgeous? And so many interesting texture in every creamy bite! I was initially a bit skeptical of the short cooking time for the grains in the original recipe at The Kitchn. However, the direction was intended for made-ahead. During the overnight rest, the grain absorbed additional liquid and became perfectly tender when served. Fruit salad need not be boring as I recently learned. Few things beat a bowl of perfectly ripen fruit but when the selection at the market did not entice, a bit of cooking skill did wonders. 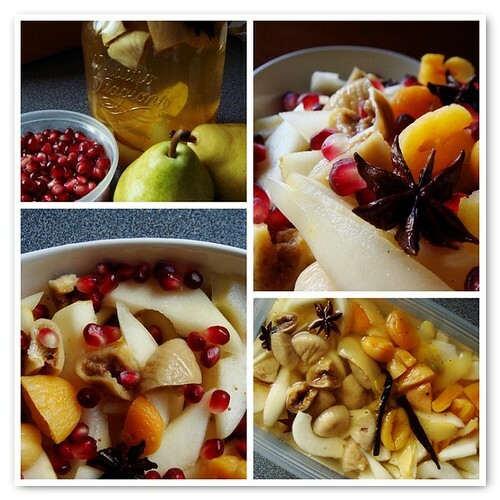 I followed smitten kitchen’s recipe to create this stunning Spiced Pear Fruit Salad with Dried Figs & Apricots. The spiced syrup of vanilla, star anise, cardamom, and lemon peel plumped the dried fruit and lightly flavoured the raw pear slices. Ruby red pomegranate studded the salad like tiny sparkling jewels. It was a refreshing addition to the brunch menu. Sometimes, simplicity can leave lasting impression. 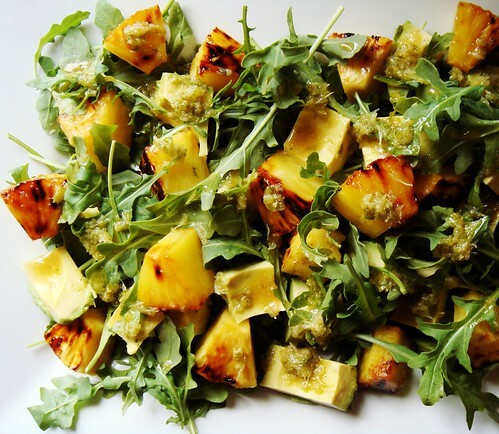 That was the case with this Cuban Avocado Arugula Pineapple Salad adapted from Maricel E. Presilla. The broiled pineapple tasted mellow and sweet. Since I broiled the pineapple the previous night, the overnight rest in the fridge created a few spoons of caramel pineapple juice. I dared not waste it and incorporated into the cumin garlic lime vinaigrette. The flavour was bold and bright. We couldn’t stop talking about this salad even days after the party! 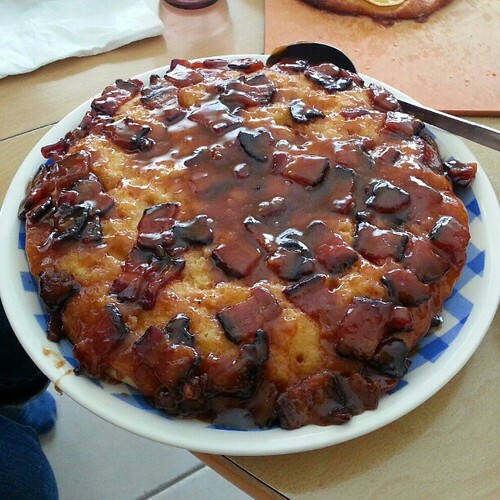 Ah, Maple Bacon Biscuit Bake, raison d'être of the party. So it was not photogenic. And its window of optimal taste was awfully brief. But what ethereal pleasure while it lasted! The planning began back in March when I went to Nashville, TN for team training camp. In my suitcase, I carried a bag of precious White Lily all purpose flour, choice of Southern bakers for biscuits. No, we cannot find this soft flour in Canada. I prepared the syrup topping and the butter-coated flour ahead of time. When brunch was well underway, I gently tossed the flour with full fat buttermilk and baked this upside-down treat while we chatted and munched. It was ready when we were ready to refill our plates. The pillowy soft biscuit were soaked with savoury sweet maple and bacon. The texture was incomparable and I am not an accomplished biscuit-baking Southern belle. I urge you. Make it, right now. And throw a party. Even since I started making bread at home, I no longer feel right to serve store-bought loaves when I entertain. This is of course ridiculous because bread baking follows its own schedule and yeast cares little about what time my guests arrive. The bread is ready when it’s ready. Bakers get up in the middle of the night so we can all enjoy fresh loaves first thing in the morning. I had no intention to set my alarm at 3am so I picked a couple of recipes with more flexible schedule. 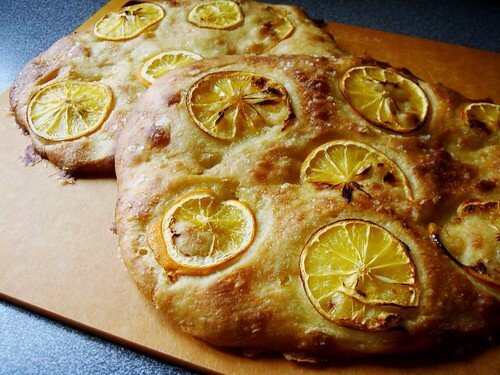 The Meyer Lemon Focaccia is similar to pizza dough in many ways: plenty of olive oil, a wet sticky dough to pull and fold, flavour development from two days of slow fermentation in the fridge, and quick blast of high heat to bake. The thin slices of Meyer lemon caramelized as promised with a lovely crunch of Demerara sugar and Maldon sea salt. I puffed my chest out with pride when I set my loaf of Braided Lemon Bread on the table. 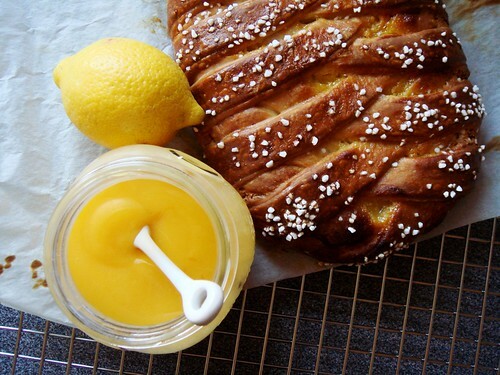 The picture perfect braid was filled with cream cheese and homemade Meyer lemon curd. I first came across this recipe at smitten kitchen and immediately vowed to bake it. Somehow, that did not happen and fate brought us together again at King Arthur Flour. I bookmarked the recipe and looked at it longingly every time I opened my to-bake list. I needed motivation or just enough abandonment to test the strength of my 4.5qt stand mixer. When I included the recipe on my brunch menu, I still wasn’t sure if it would make its way to the table. Finally, it dawned on me to follow the proportion of the dough but mix it by hand using Dan Lepard’s 15 second knead + 10 minute rest method. That method serves me well so why risk burning the mixer motor? The enriched dough was well-behaved and shaping couldn’t be easier. Why I dragged my feet for so long? It wasn’t even hard to make. The result was of course beyond expectation. The homemade Meyer lemon curd was tangy, offsetting the rich cream cheese filling. 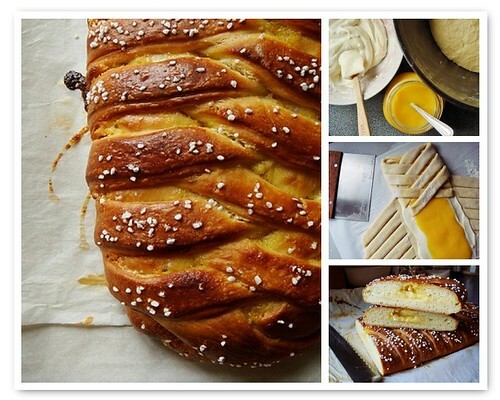 This braided lemon loaf sat somewhere between bread and coffee cake…i.e. everything brunch. I am inspired to repeat this recipe and fill the braid with homemade raspberry rose jam. Breakfast is not complete without coffee. Mine came in the form of cold brew coffee concentrate to easily serve a crowd. I outfitted the drink station with big bowl of ice, a tub of homemade goat milk cajeta, and choice of milk, half & half, and almond milk. 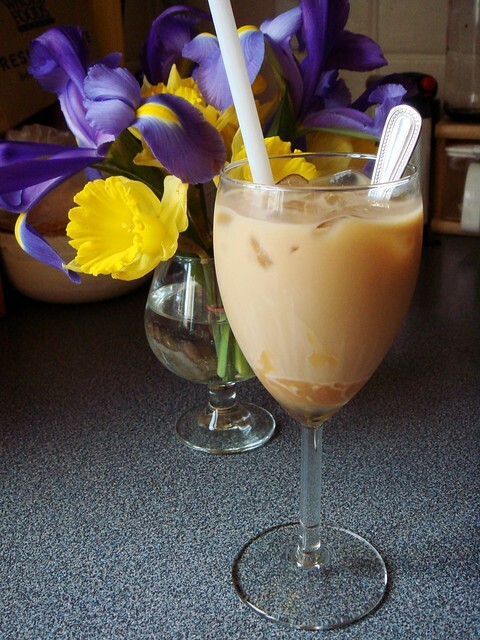 Iced coffee for everyone! And that concluded the Epic Brunch that outdid all my previous brunch parties. All dishes were readied within 45 minutes of the arrival of my friends and this time I remembered to offer them drinks! I think I am finally getting the hang of entertaining at home. Also check out foodpr0n's and boneats' photo albums!